My family isn’t really into holidays. If I’m not at the helm of the celebrations, nothing actually gets celebrated. I’m usually the one in charge of Christmas and Thanksgiving, along with birthdays and any other festivities. That’s because I love traditions, and even though our Easter traditions died with my youth, I’m tempted to resurrect them now as an adult (see what I did there?). When my sister and I were younger, we’d do the fancy dress, church, candy deal. All the kids in the building would get together and share candy while wearing our Sunday best, while the adults did their own thing. These days, we don’t really do much for Easter. The only thing kept alive during these times is the making of a huge pot of habichuelas con dulce for Good Friday; a sweet dessert type thing from the homeland made of blended, cooked red beans with tons of milk, sugar, spices, and patience. Inside of this slurry there are raisins, sometimes yellow yams (sweet potatoes? ), and these mini milk cookies that I dubbed ‘Jesus crackers.’ This is the only highlight of Holy Week for me, and while we still get a taste of this traditional drink/dessert every year, I wanted to do more. In an effort to inject a little bit of some American traditions into my house, I tried making some hot cross buns. We were already used to buying those hot cross buns from the supermarket around this time of year. You know the ones; in a certain white and blue box boasting a mass of perforated shiny slabs that held barely any dried fruit, draped with a thick, white and slippery cross of icing draped over the top. Well, not this year. The last time we had these in the house, I realized that I could do better. My family could do better. Sure, these buns were alright by their standards, but why stick to the packaged stuff when it’s this easy to make your own? After getting really accustomed to working with yeast and getting real deep in dough, I knew this wasn’t much of a challenge. Except, I needed a recipe. I had an idea of what I wanted for these buns. My parental units like their carbs on the sweet side, so that was a no brainer. They’re also pretty into dried fruit. Besides taking part in hot cross buns during Easter, they are also big fans of fruitcake for Christmas. Yes, the stuff most people throw out, my parents purchase willingly. What can I say? They dig the fruit. 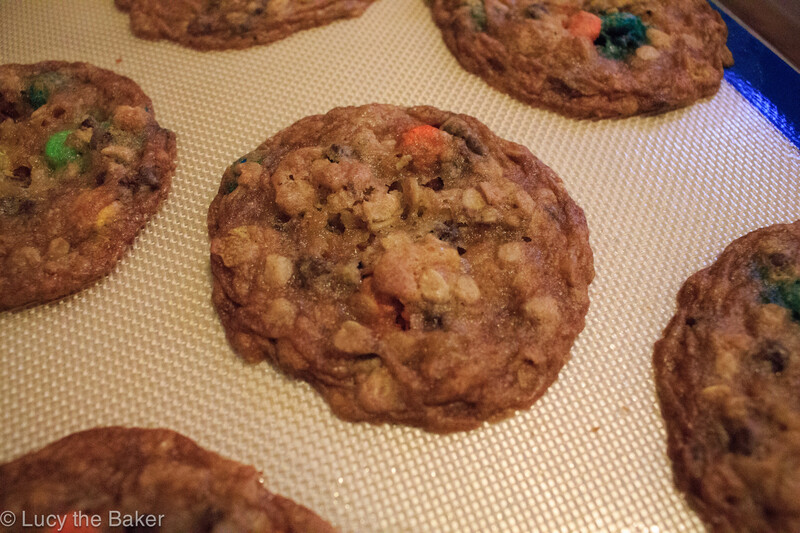 Anyway, I knew I wanted to throw in as much dried fruit as I could into these babies. I opted for The Pioneer Woman’s super easy recipe but adjusted the amounts of fruit, among other things. Besides the recommended raisins, I also threw in some dried cranberries and chopped, dried apricots into the dough. All the dried fruit was about a cup’s worth, meaning these were packed with fruity goodness. I was tempted to soak them in some booze first but this is a holy holiday; I’m not about to get struck by lightning or spontaneously combust into flames over some boozy fruit. 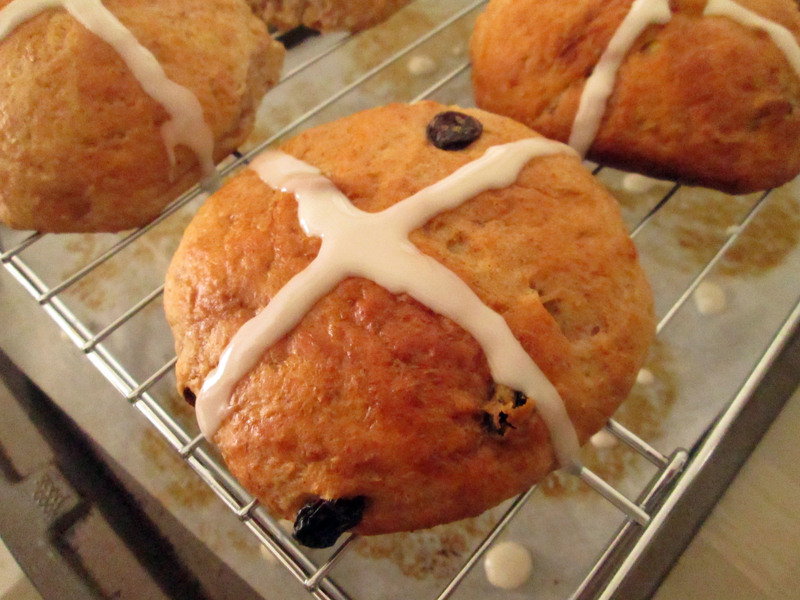 Not only was I tempted to booze these buns up, I almost didn’t add the cross. Before y’all smite me, let me explain. I’ve mentioned it several times here already but in case you didn’t know, my folks are not fond of any type of icing or frosting. Shameful, I know but that’s just how they roll. I’m quite the opposite (thank goodness) but I didn’t want my parents to skip out on these, considering I made these with them in mind. I even contemplated just doing some of them but that’s just not right. The whole point of these things is the cross; hence the name “hot cross buns.” What are they without that strip of frosting? A roll. It’s just a roll. I threw caution to the wind and crossed them all, hoping I didn’t just make a huge mistake. 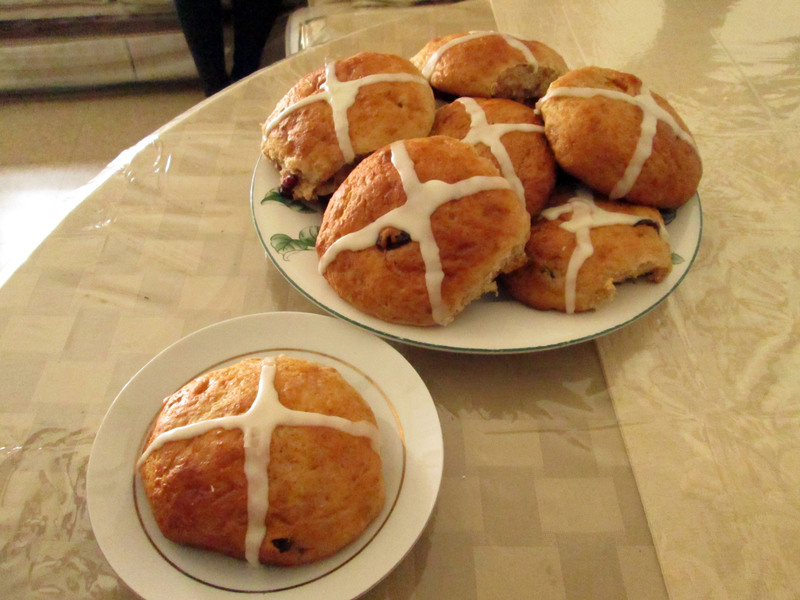 While these buns are traditionally supposed to be eaten on Good Friday, we had these for Easter Sunday. And despite the presence of icing, these were actually a big hit! Not surprising, considering the circumstances. 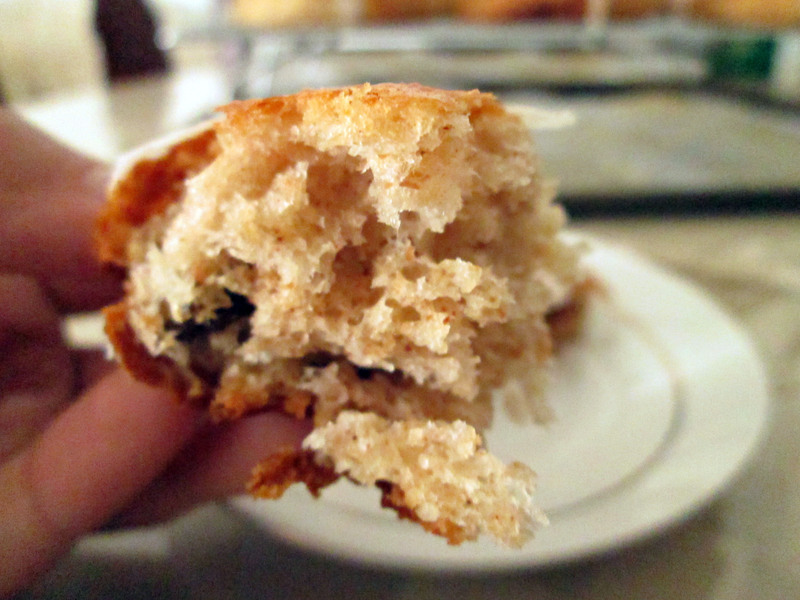 Even though the dough was a little tricky to work with, the buns came out super soft, chewy, and studded with fruit. The icing cross actually made these buns, adding an extra hint of sweetness to these lightly sweetened buns. Crazy what a little icing can do! 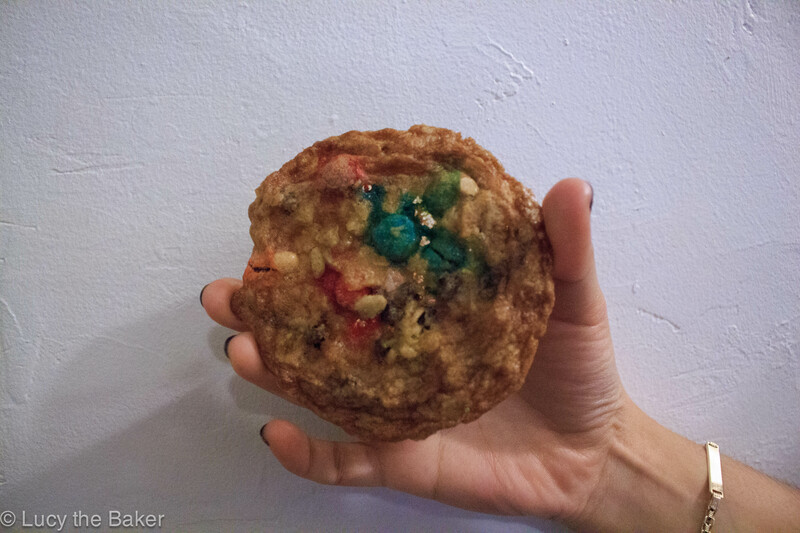 No one missed the tasteless, slimy, and sticky mess from the box this year. While this wasn’t what we used to do for Easter back in the day, it may be the beginning of a new tradition. Something tells me this won’t be the last time I make these, either. For the buns: combine 2 cups of milk, stick of butter and 1/2 cup of sugar in a sauce pan. Heat until butter is just melted. Mix should be warm but not boiling. Take off heat and allow the mixture to cool slightly. 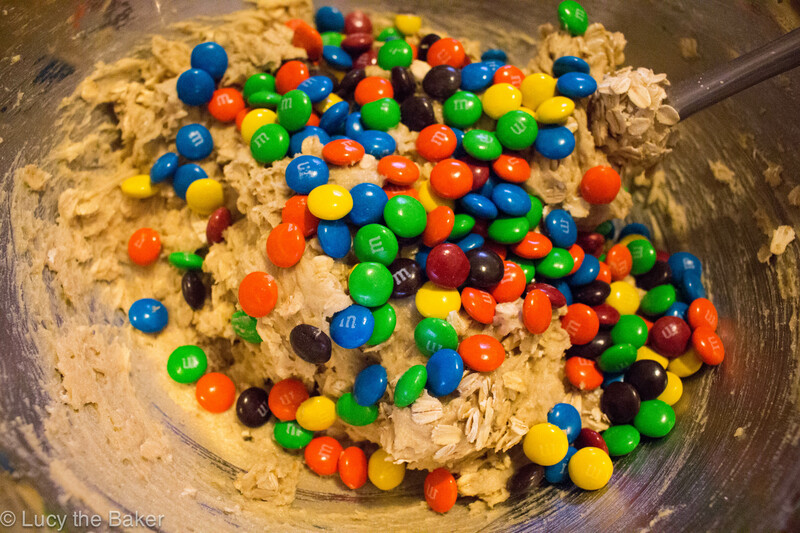 Pour the mix into a bigger bowl. 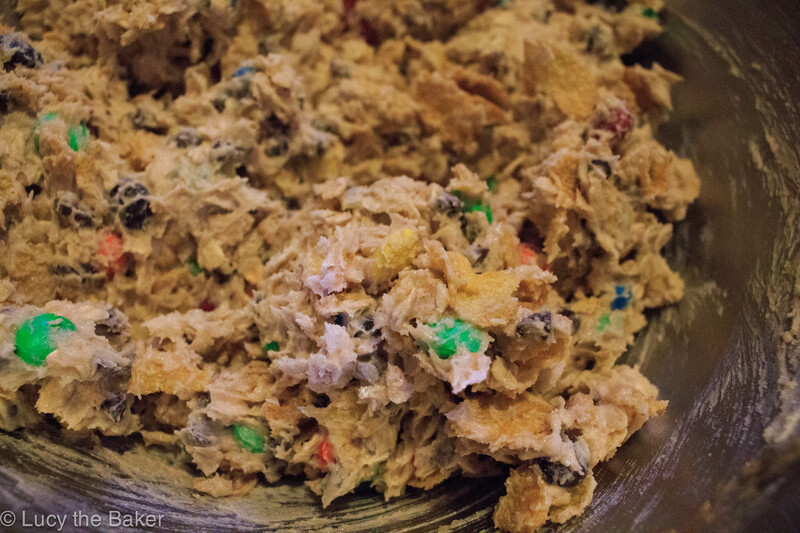 Sprinkle the yeast onto the liquid mix and add the 2 cups of whole wheat flour, and the 2 cups of all-purpose flour. Stir to combine; the mixture should be sticky. Cover and let rise for 1 hour. Add the remaining 1/2 cup of flour, baking soda, baking powder, and salt. Stir to combine. In a smaller bowl, combine the 1/4 cup of sugar with the cinnamon and other spices. Set aside for now. Lightly flour your surface. Turn dough out and slightly flatten. Sprinkle a couple of tablespoons of the spiced sugar, and about a third of the dried fruits. Fold the dough over onto itself, flattening slightly. You should have a “plain” surface of dough. Sprinkle some more spiced sugar, dried fruit, and fold the dough over again. Repeat this process once more. No worries if you have left over spiced sugar. Portion and form the dough into dough balls. Place on a lined baking sheet and cover. Proof for 30 minutes to an hour. For the glaze: In a small bowl, whisk together the egg white with a splash of milk. Brush the risen balls of dough with the beaten white. Bake rolls for about 20 minutes, or until tops are golden brown. Remove from the pan and transfer to wire racks to COOL COMPLETELY. For the icing: beat the egg white with enough sifted powdered sugar to make a thick icing. Add in small amounts of milk, if needed, to reach your desired consistency. Place icing in a ziplock bag. Snip the corner off and pipe icing crosses onto each roll.